By Brian F. McQuillan, M.D., Scott Zelasko, M.D., Ely A. Wolin, M.D. 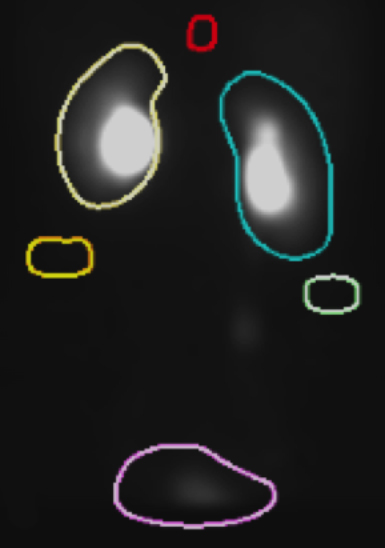 Similar to other facets of nuclear medicine, scintigraphic imaging of the genitourinary system emphasizes physiology over anatomy, which is typically evaluated with either ultrasound, computed tomography, or MRI. 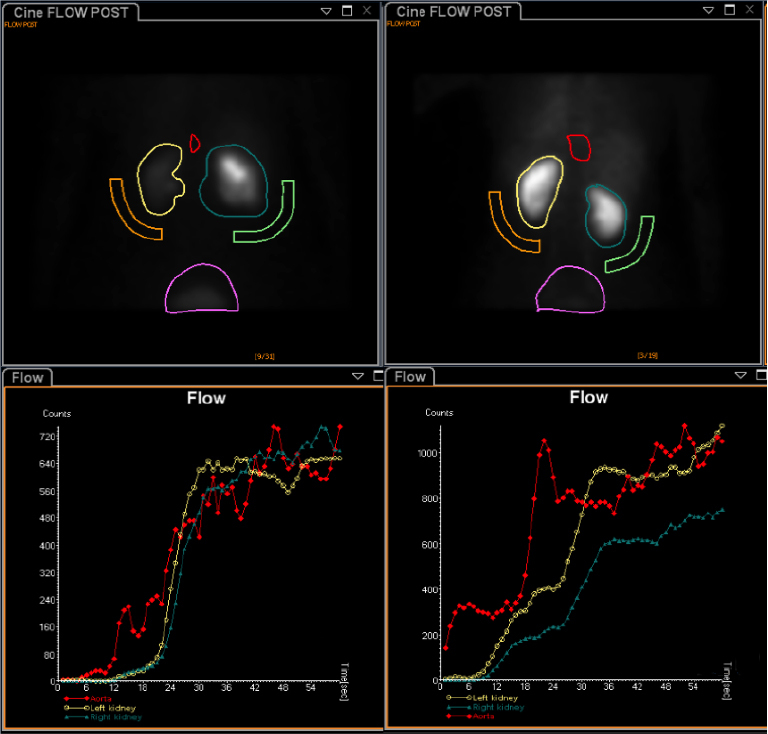 Nuclear medicine studies catered toward the genitourinary system in nontransplant patients assess renal blood flow, evaluate renal function, identify mechanical or functional obstruction, evaluate for renovascular hypertension, and assess vesicoureteral reflux. This article will review the most common radiopharmaceuticals and their clinical applications in evaluating the genitourinary system in native, nontransplant kidneys. The kidneys filter the systemic blood supply by two mechanisms: passive filtration through the glomerulus and active tubular secretion. Approximately 20% of renal plasma flow is filtered and 80% is secreted. The glomerulus primarily filters larger compounds out of the urine, although some larger proteins are excreted into the urine by active secretion from the tubules. 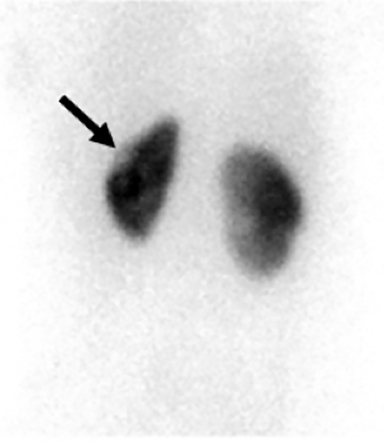 While many radiopharmaceuticals have been used for renal imaging, the most common in clinical practice include technetium-99m (Tc-99m) mercaptoacetyltriglycerine (MAG3), Tc-99m dimercaptosuccinic acid (DMSA), Tc-99m diethylenetriaminepentaacetic acid (DTPA), and Tc-99m sulfur colloid. 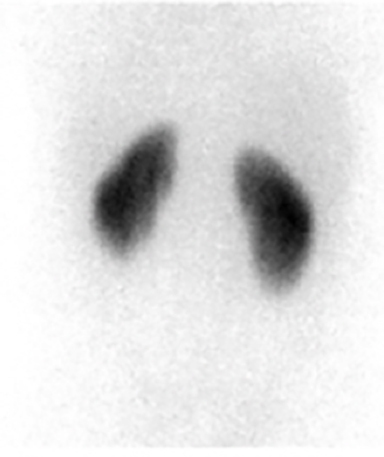 Tc-99m MAG3 is the most frequently used renal radiopharmaceutical in the United States (approximately 70% of cases) and is almost completely cleared by tubular secretion.1 Tc-99m MAG3 clearance correlates well with effective renal plasma flow and can be used as an independent measure of renal function. Tc-99m DMSA is the radiopharmaceutical of choice for renal cortical imaging, since it binds to sulfhydryl groups on the proximal convoluted tubule, allowing for minimal cortical transit. Tc-99m DTPA is a heavy metal chelator that is cleared by glomerular filtration. Tc-99 DTPA is used primarily for glomerular filtration rate (GFR) analysis, but may also be used in evaluation for renovascular hypertension.2 Tc-99m sulfur colloid is the preferred radiopharmaceutical in the evaluation for vesicoureteral reflux. After Tc-99m MAG3 is administered intravenously, posterior dynamic images are obtained for a total of approximately 30 minutes. 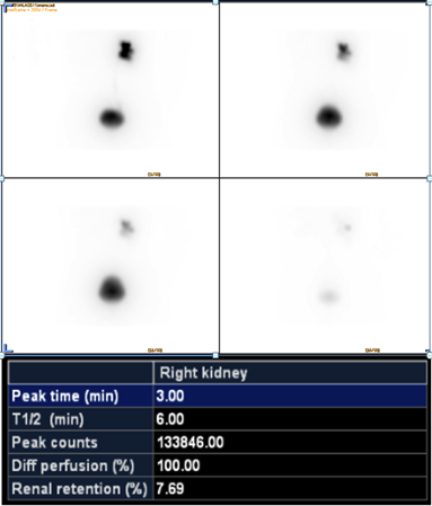 Images are acquired every 1 to 5 seconds for the first minute to assess renal perfusion. One-minute images are then obtained for the remainder of the exam to evaluate cortical uptake and transit, as well as excretion. Peak cortical activity should occur within 3 to 5 minutes, with half of the peak activity (T1/2) cleared from the kidney at 8 to 12 minutes. Less than 30% of peak activity should remain within the renal cortex at 20 minutes (Figure 4).2 A delay in cortical time to peak, prolonged cortical transit, or increased 20-minute cortical residual are nonspecific indicators of nephron dysfunction from acute or chronic renal disease (Figure 5). While anatomic imaging can demonstrate dilation of the genitourinary collecting system, it is less reliable in delineating between obstructive and nonobstructive causes in the absence of a visualized source of obstruction. 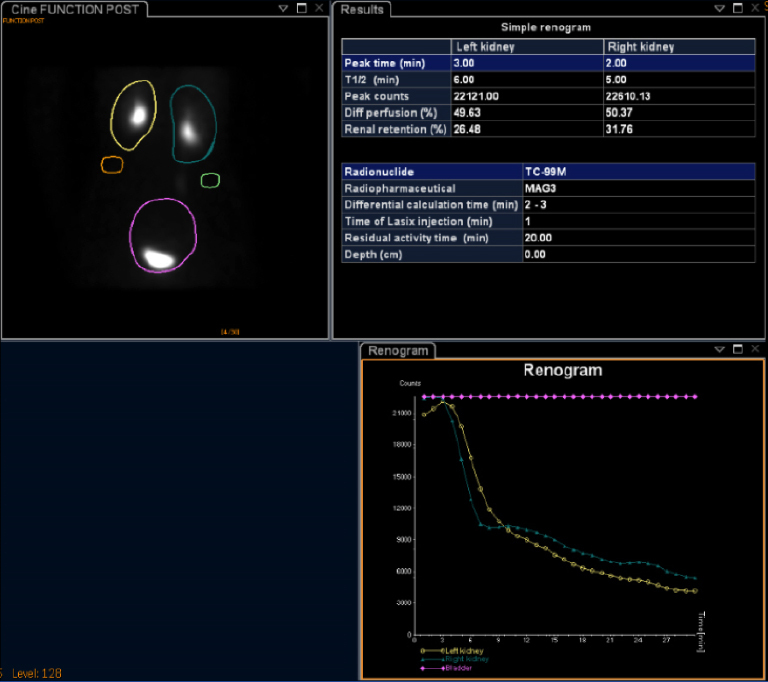 A patulous system with decreased peristalsis can result in dilation of the renal collecting system in the absence of a mechanical obstruction in a variety of clinical settings, to include vesicoureteral reflux (VUR), megaureter, and prior mechanical obstruction or infection.4 Diuretic renography can be helpful in these clinical scenarios. If collecting system dilation is due to a mechanical obstruction (eg, stone, stricture or mass), delayed washout of collecting system activity will be seen even after the administration of IV furosemide (Figure 6). If the dilation is not the result of an underlying mechanical obstruction, the increased urine production after diuretic administration will increase hydrostatic pressure enough to wash out the patulous system and T1/2 will normalize on dynamic renography (Figure 7).10 This process requires functioning renal tissue for the diuretic effect and can be negated by dehydration. T1/2 washout is considered normal if it occurs < 10 minutes after diuretic administration and abnormal if it is > 20 minutes.6 The 10 to 20 minute timeframe is less specific. At our institution, values of 10 to 15 minutes are generally deemed likely not obstructed, and values of 15 to 20 minutes are deemed likely obstructed. 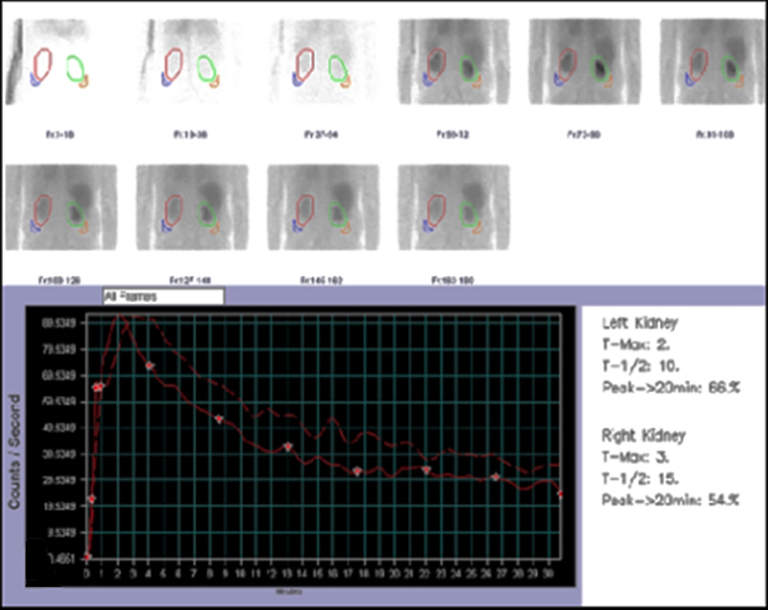 Washout parameters from dynamic renography for patients with a dilated but not obstructed system will be normal if the diuretic is administered at the same time as (F+0 protocol), or prior to (F-15 protocol) administration of the radiopharmaceutical (Figure 8). Pyelonephritis refers to an infection involving the kidneys and has a variety of imaging appearances to include single or multiple cortical defects, and localized or diffuse decreased activity in one or both kidneys.12 Scintigraphy is sensitive for pyelonephritis and is especially useful in excluding pyelonephritis (with a normal study) in pediatric patients who often present with more challenging clinical symptoms. The primary limitation is the lack of specificity for an underlying infectious process. Renal artery stenosis (RAS), usually due to atherosclerosis or fibromuscular dysplasia, is a relatively uncommon but important cause of hypertension. The associated hypertension is a result of the normal physiologic mechanisms designed to maintain glomerular filtration pressure. When there is decreased renal perfusion pressure secondary to RAS, renin is released by the juxtaglomerular apparatus (JGA). Renin is converted to angiotensin I (ATI) by angiotensinogen in the liver, which, in turn, is converted by ACE in the lungs to angiotensin II (ATII). ATII is vasoactive and results in vasoconstriction of the efferent arteriole, thus increasing pressure across the glomerulus. 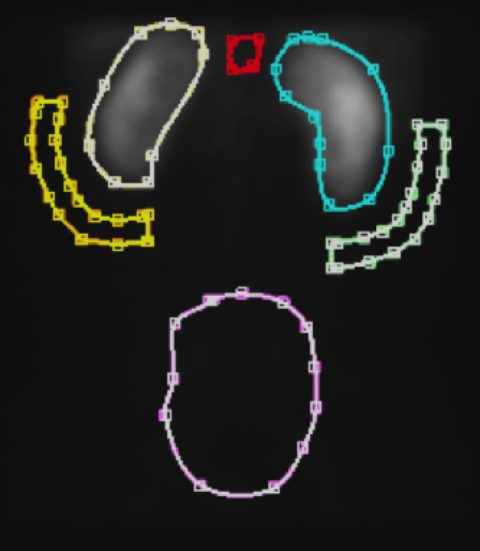 Dynamic renography utilizing ACEI administration can help diagnose renovascular hypertension in at-risk patients, as there are no discriminatory clinical findings.16 The ACEI works by preventing the conversion of ATI to ATII in the lungs, thus preventing the compensatory renal vasoconstriction of the efferent arteriole. At-risk patients include those who initially present with hypertension before 30 or after 55 years of age; have severe or accelerated hypertension refractory to medical management; experience new difficulty with medical management; have evidence of occlusive vascular disease on other imaging modalities; have decreased renal function with recent hypertension; and/or exhibit abdominal pain or bruits auscultated over the flanks.17 The primary goal of ACEI renography is to identify patients who would benefit from correction of the underlying renal artery stenosis. Protocols for ACEI renography generally involve a one- or two-day study. With a two-day protocol, an ACEI study is initially performed. If the study is normal, no further imaging is necessary. If abnormal, the patient returns on day two for a baseline study. The one-day protocol involves obtaining a baseline study with a low dose of radiopharmaceutical several hours prior to the ACEI study. Furosemide may be administered to clear the renal collection system.20 An ACEI study is performed approximately one hour following the oral administration of 25-50 mg of captopril or 15 minutes after 0.04mg/kg of IV enalapril.17 Ten mCi of Tc-99m MAG3 or DTPA is administered intravenously and renal scintigraphy is performed. Scintigraphy plays an important role in the evaluation of a variety of genitourinary pathologies. 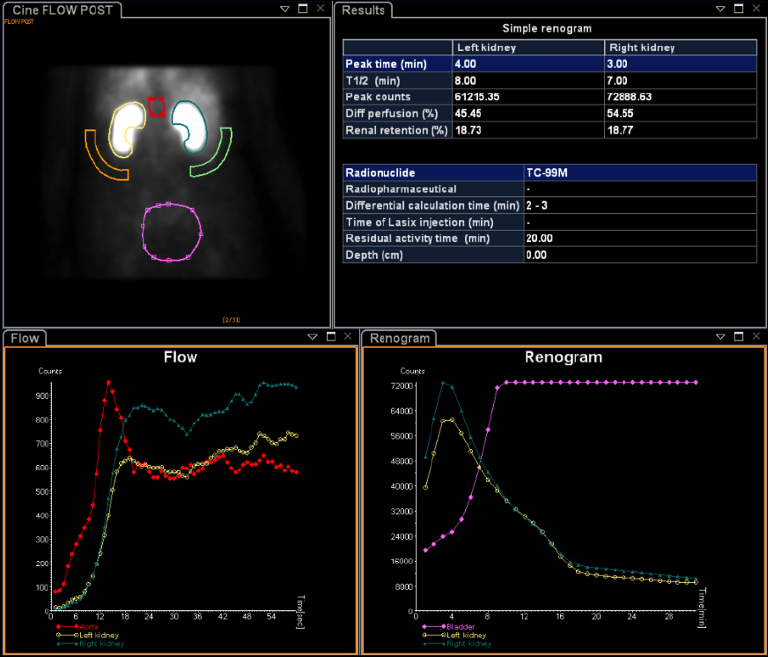 Its ability to assess renal function complements other cross-sectional modalities that rely more on anatomic assessment. Having a fundamental knowledge of the radiopharmaceuticals, clinical applications, and common pathologies is essential for those involved with interpretation of genitourinary nuclear medicine studies. Taylor AT. Radionuclides in nephrourology, part 1: radiopharmaceuticals, quality control and quantitative indices. J Nucl Med 2014;55(4)608-615. Taylor A, Nally JV. Clinical applications of renal scintigraphy. Am J Roentgenol 1995;164(1):31-41. Esteves FP, Taylor A, Manatunga A, et al. 99mTc-MAG3 renography: normal values for MAG3 clearance and curve parameters, excretory parameters, and residual urine volume. Am J Roentgenol 2006;187(6):W610-W617. Mettler FA, Guibeteau MJ. Genitourinary system and adrenal glands. In: Essentials of Nuclear Medicine Imaging. 5th Ed. Philadelphia, PA: Saunders Elsevier; 2006:293-324. Keramida G, James JM, Prescott MC, Peters AM. Pitfalls and limitations of radionuclide renal imaging in adults. Semin Nucl Med 2015;45(5):428-439. Karam M, Feustel PJ, Goldfarb CR, et al. Diuretic renogram clearance half-times in the diagnosis of obstructive uropathy: effect of age and previous surgery. Nucl Med Commun 2003;24(7):797-807. Taylor AT, Garcia EV. 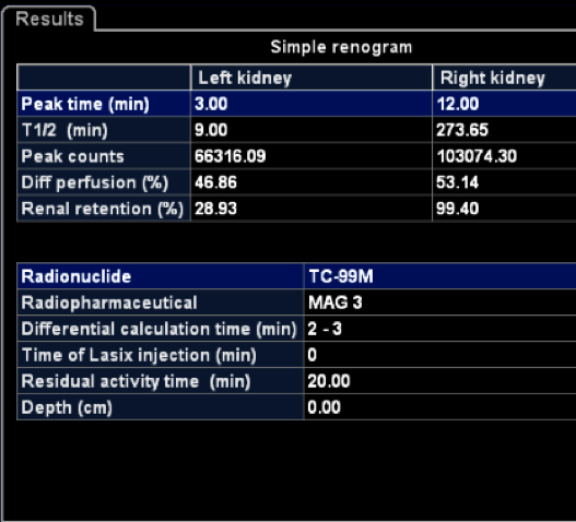 Computer assisted diagnosis in renal nuclear medicine: rationale, methodology and interpretative criteria for diuretic renography. Semin Nucl Med 2014;44(2):146-158. Slatore CG, Tilles SA. Sulfonamide hypersensitivity. Immunol Allergy Clin N Am 2004;24:477-490. Türkölmez S, Atasever T, Türkölmez K, et al. 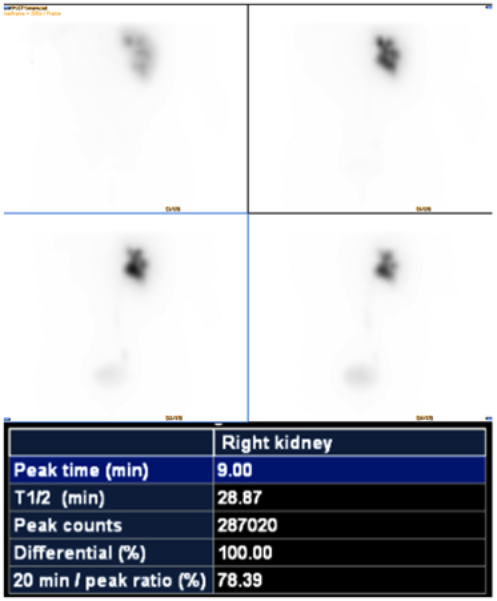 Comparison of three different diuretic renal scintigraphy protocols in patients with dilated upper urinary tracts. Clin Nucl Med 2004:29(3);154-160. Livnat U, Mellnick V, Menias C, et al. Nuclear medicine in the acute clinical setting: indications, imaging findings, and potential pitfalls. 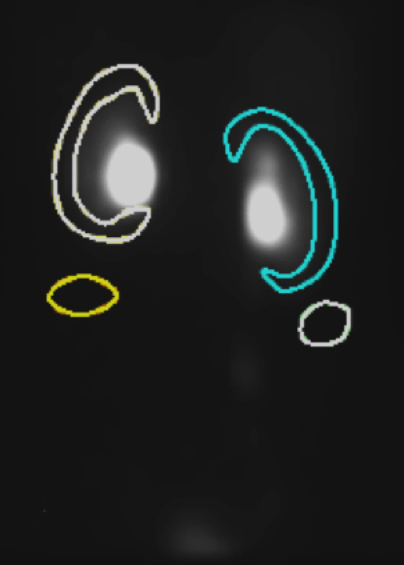 Radiographics 2013:33;375-396. Blaufox MD. Procedures of choice in renal nuclear medicine. J Nucl Med 1991;32(6):1301-1309. Lavocat MP, Granjon D, Allard D, et al. 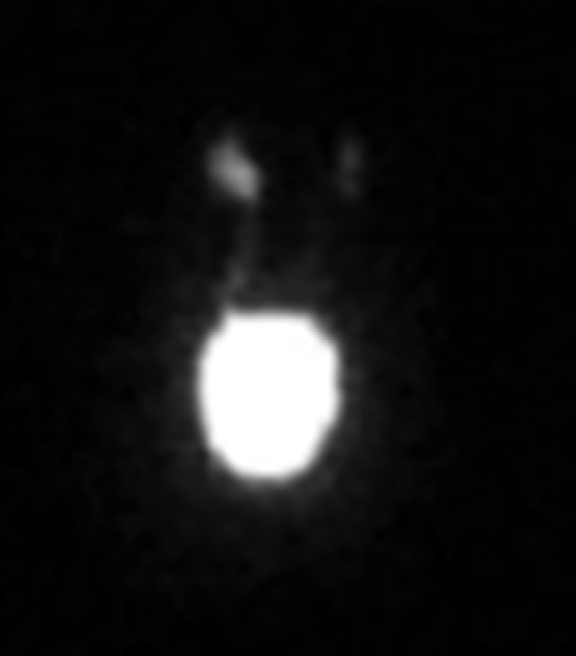 Imaging of pyelonephritis. Pediatr Radiol 1997;27:159-165. Rossleigh MA. Renal cortical scintigraphy and diuresis renography in infants and children. J Nucl Med 2001;42(1):91-95. Björgvinsson E, Majd M, Eggli KD. Diagnosis of acute pyelonephritis in children: comparison of sonography and Tc-99m DMSA scintigraphy. Am J Roentgenol 1990;157(1):539-543. Agras K, Ortapamuk H, Naldöken S, et al. Resolution of cortical lesions on serial renal scans in children with acute pyelonephritis. Pediatr Radiol 2007;37(2):153-158. Soulez G, Oliva VL, Turpin S, et al. Imaging of renovascular hypertension: respective values of renal scintigraphy, renal doppler US, and MR angiography. Radiographics 2000;20(5):1355-1368. Taylor AT. 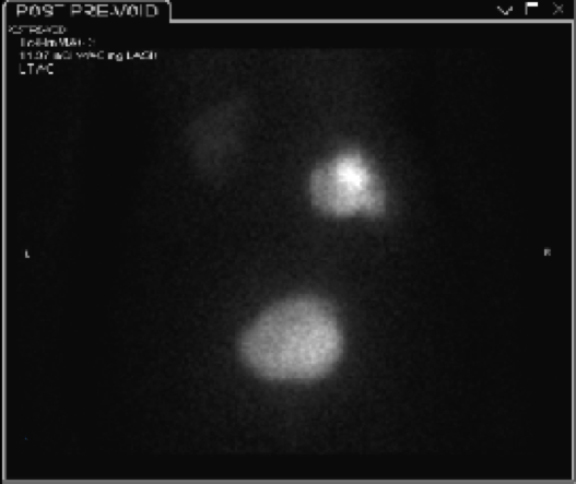 Radionuclide in nephrourology, part 2: pitfalls and diagnostic applications. J Nucl Med 2014;55(5):786-798. Taylor A, Nally J, Aurell M, et al. Consensus report on ACE inhibitor renography for detecting renovascular hypertension. J Nucl Med 1996;37:1876-1882. Claveau-Tremblay R, Turpin S, De Braekeleer M, et al. False-positive captopril renography in patients taking calcium antagonists. J Nucl Med 1998;39(9): 1621-1626. Boubaker A, Prior JO, Meuwly JY, et al. 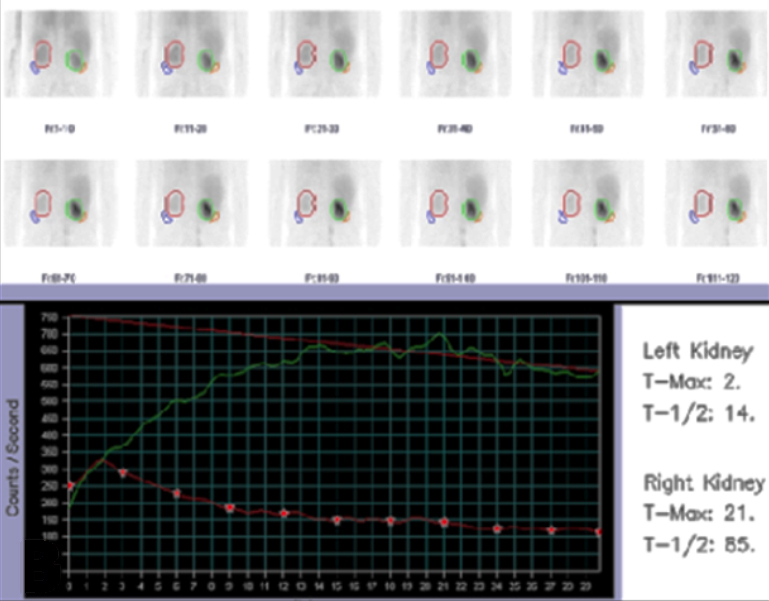 Radionuclide investigations of the urinary tract in the era of multimodality imaging. J Nucl Med 2006;47:1819-1836. Taylor AT Jr, Blaufox MD, Dubovsky EV, et al. Society of Nuclear Medicine procedure guideline for diagnosis of renovascular hypertension version 3.0. Society of Nuclear Medicine 2003;Aug:97-104. Piepsz A, Ham HR. Pediatric applications of renal nuclear medicine. Semin Nucl Med 2006;36:16-35. ACR–SPR–SNM Practice guideline for the performance of adult and pediatric radionuclide cystography, Revised 2010 (Resolution 39). 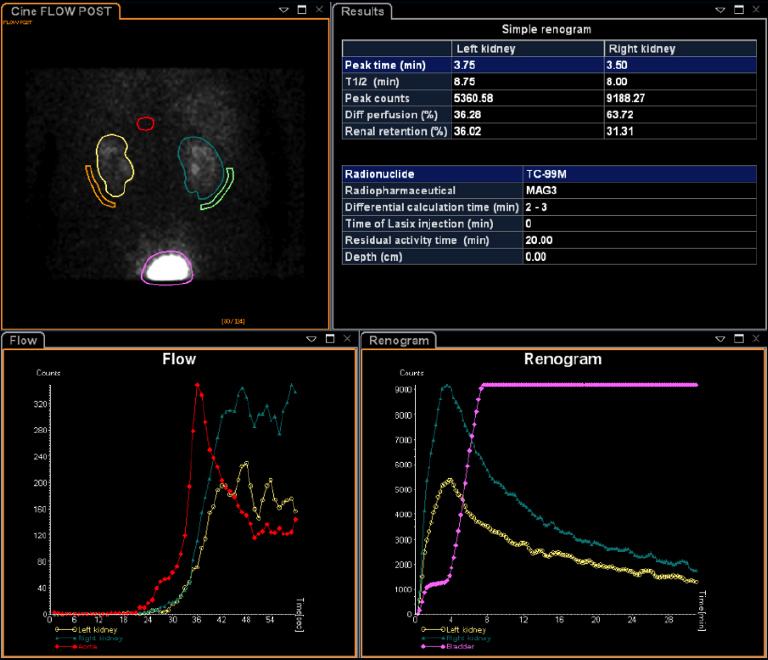 http://snmmi.files.cms-plus.com/docs/Radionuclide_Cystography_1382732076756_9.pdf. Accessed April 29, 2016. Disclaimer: The views expressed in this article are those of the author and do not necessarily reflect the official policy or position of the Department of the Air Force, Department of Defense, or the U.S. Government. McQuillan BF, Zelasko S, Wolin EA. Nuclear Medicine Genitourinary Imaging in Native Kidneys. J Am Osteopath Coll Radiol. 2016;5(3):14-20. Brian F. McQuillan, M.D., Scott Zelasko, M.D., Ely A. Wolin, M.D. Drs. McQuillan, Zelasko, and Wolin are with the Department of Radiology, David Grant USAF Medical Center, Travis AFB, CA.